The goTenna Mesh offers users a simple and powerful way to stay connected while off the grid – offering both convenience and safety. When heading off the beaten path, such as when camping or hiking, we often find ourselves in a situation where cell service isn’t very reliable. This can sometimes be nice as it affords us the opportunity to disconnect from the hustle and bustle of daily life, but cell phones have more utility than just texting our friends about dinner plans. Having no cell service can be a death sentence in emergency situations, and the goTenna Mesh seeks to add a convenient way to communicate while off the grid. Previously, our best option for getting cell service was to wander around in hopes that the connection improves or forgoe service altogether. 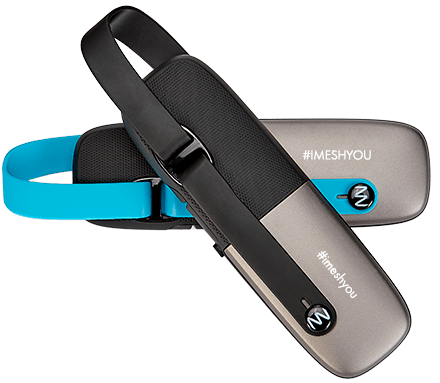 The goTenna Mesh offers a third option – create our own mobile networks. The goTenna mesh is a portable network that pairs to your smartphone and create its own signal – all without having to be connected to your traditional network. At that point, you can send texts and GPS locations to other goTenna Mesh users in the area. GoTenna Mesh functions as a “mesh” networking device – privately and automatically relaying methods through other goTenna devices to expand your network beyond what you’re singular device is capable of. The goTenna Mesh won’t replace the functionalities of a traditional cell network, but offers a way to communicate long-distance with important emergency contacts – serving as a way to get help in a pinch rather than a primary way of staying connected. Unfortunately the future of carrying 4G in your pocket wherever you go hasn’t yet been realized, but for what it sets out to do the goTenna Mesh does an admirable job. The goTenna Mesh is sold in pairs, and has a range ofup to 4 miles in open areas and up to 0.5areas in dense locations. Obstacles like buildings and trees can compromise the signal, meaning that you’ll have better signals in areas like the desert than you would a densely packed city or theme park. Still, half a mile is still a decent range and extends further than many walkie-talkies – an alternative communication device that the goTenna Mesh hopes to improve upon. Once you receive the goTenna Mesh, you control it primarily through the goTenna application. You set up your contact information on your phone and can then pair your device. On the left hand of the device you can access tabs for messages, contacts, locations, and settings, as well as an option to activate “relay mode” to increase the coverage of your mesh network. The goTenna app extends beyond communication as well, including some useful information like topographic and street maps as well which makes it easier to avoid getting lost. There’s also the ability to download this information for use offline in case you find yourself stranded without a connection. The map is also quite useful as you can broadcast your location using a “shout” feature that will help people find you – a feature that adds both convenience and safety should you become separated from your party while out and about. The goTenna Mesh is available starting at $155 which is a relatively steep price, but it may be well worth it considering the convenience and peace of mind it can add to your next outing.